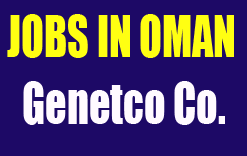 Genetco is a 100% Omani company. In 48 years Genetco has gained significant reputation and market share in Retail and Distribution of Electronics & Home Appliances, Music & Sound Systems, Office Automation,Engineering Projects – Air Conditioning & MEP (Mechanical, Electrical, Plumbing), Elevators, Refrigeration & Cold Rooms, Commercial Kitchen & Laundromats, Facilities Management & Engineering Services. Genetco has become one of the largest and most diversified companies in Engineering and Trade in the Sultanate of Oman. Accommodation provided and all other benefits as per Oman labour law.